14-year-old Joe (Ed Oxenbould) is the only child of Jeanette (Carey Mulligan) and Jerry (Jake Gyllenhaal) - a housewife and a golf pro - in a small town in 1960s Montana. Nearby, an uncontrolled forest fire rages close to the Canadian border, and when Jerry loses his job - and his sense of purpose - he decides to join the cause of fighting the fire, leaving his wife and son to fend for themselves. Suddenly forced into the role of an adult, Joe witnesses his mother’s struggle as she tries to keep her head above water. Wildlife is Paul Dano's directorial debut. Dano also co-wrote the movie's screenplay with Zoe Kazan (based on a book by Richard Ford). I mention this because, if Wildlife is anything to go by, this is a filmmaking partnership to watch out for in the future. This is just such an impressive first film from Dano. His direction is remarkably assured - both in the way he structures his narrative and also in the way he uses his camera (alongside cinematographer, Diego García) to tell this intimate and yet universal story. Events unfold from the perspective of 14 year old, Joe. Ed Oxenbould is superb in this role - we sense his growing desperation as the precarious stability of his family comes under threat. This is a coming of age story told from a different point of view. It is not easy to watch Joe’s life fall apart. He is forced to grow up as a result of his father’s inability to accept the reality of his life and his mother’s questionable choices - albeit made in the face of desperation, panic and a sense of powerlessness. Both his parents are flawed. They are endearing and unlikable in equal measure - in short, they are human. Jake Gyllenhaal gives a brilliant performance as Jerry. However, it is Carey Mulligan's portrayal of Jeanette that steals the show. Mulligan really brings Jeanette to life. Hers is a powerful, nuanced portrayal of a woman who is trying to find a way to survive. Jeanette is wonderfully complex - she makes mistakes and is often hard to like but, at the same time, she is a magnetic and deeply sympathetic character. 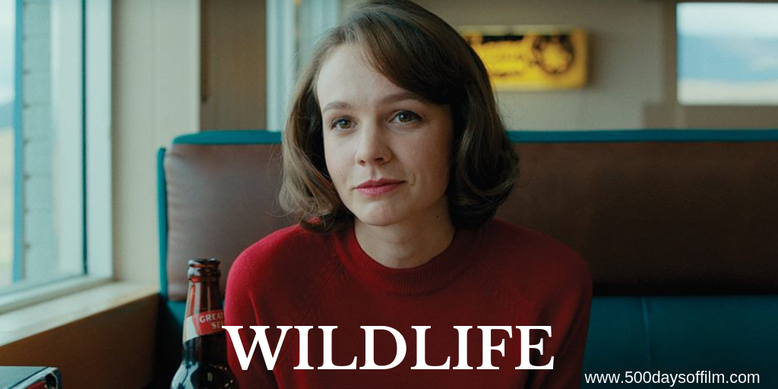 I would wholeheartedly recommend Wildlife and cannot wait to see what Dano and Kazan do next.